Although she disliked being typecast as a Spanish music specialist, there’s no doubt that Alicia de Larrocha’s way with this music is in a class by itself. No matter what the repertoire for a recital she gave, regardless of whether it included Spanish music, she was often called upon by her audiences to provide at least one Spanish encore. Over her performing lifetime she built up many of these, and in 1974 made a recording of thirteen of them entitled ‘Spanish Piano Music’ (SXL 6734: tracks 1–13 on this reissue). This LP forms the core of this reissue and is filled out with other encore-worthy Spanish titles. 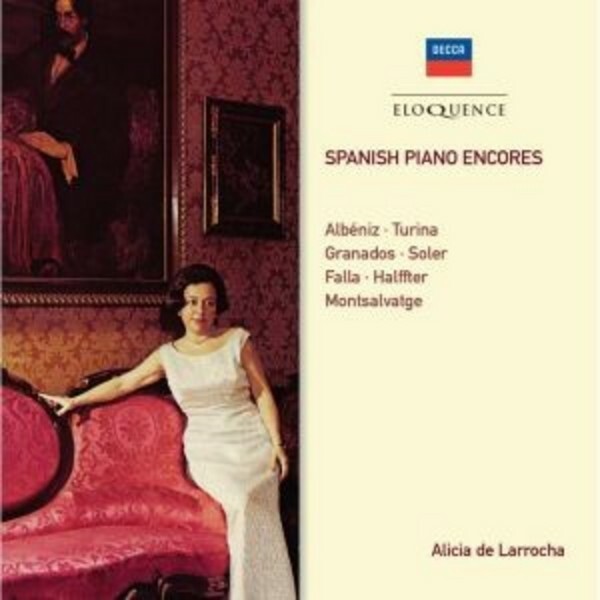 While Albéniz (with six pieces) and Granados (with four) form the core of the reissue, there’s also zesty Spanish Baroque music by Mateo Albéniz (no relation of Isaac) and Antonio Soler, two dances from Falla ballet music despatched with disarming ease by Larrocha in their keyboard versions, and miniatures by Halffter, Nin-Culmell and Montsalvatge.